When adding decorations to the edges of your seams or patterns, sometimes using double-folded bias tape is a good way to make it pop. 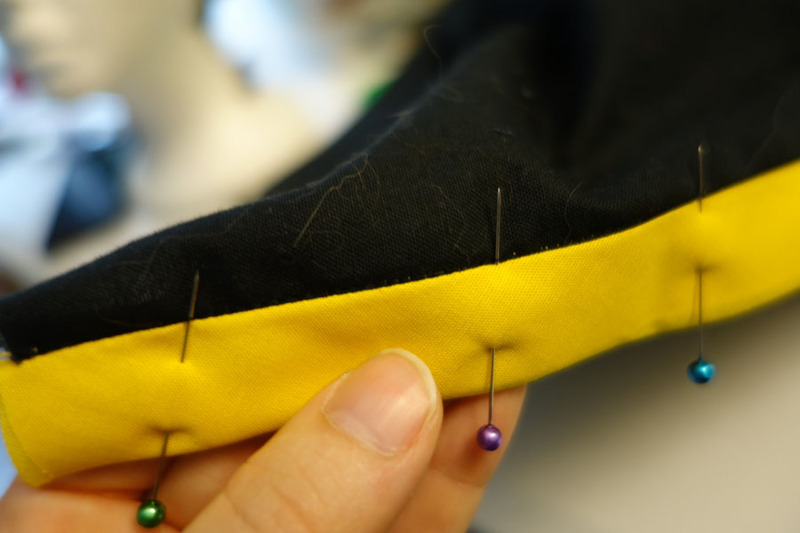 The most common way beginners attach bias tape is via one solid top stitch (or sometimes even two- one for each side.) Although it's effective, it certainly isn't the cleanest option. If you'd like a semi-clean bias tape stitch without needing to invisible hands-stitch the opposing seam or using heat-n-bond, the Hong Kong Finish is for you! 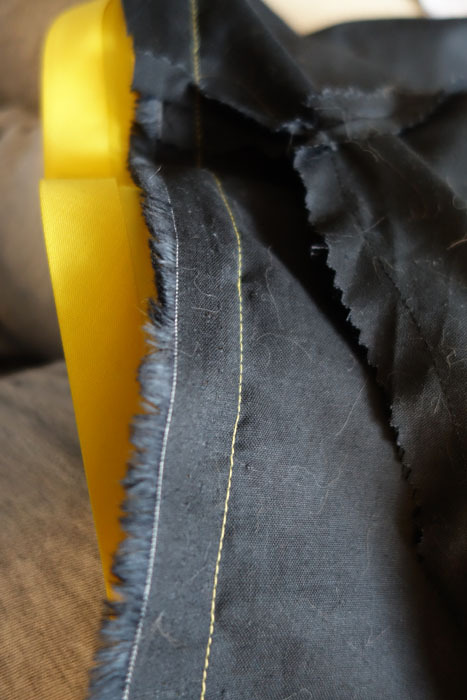 It implements a clean seam on the shell while using a sneaky method to bind that backside, and is faster than hand stitching a hidden stitch. 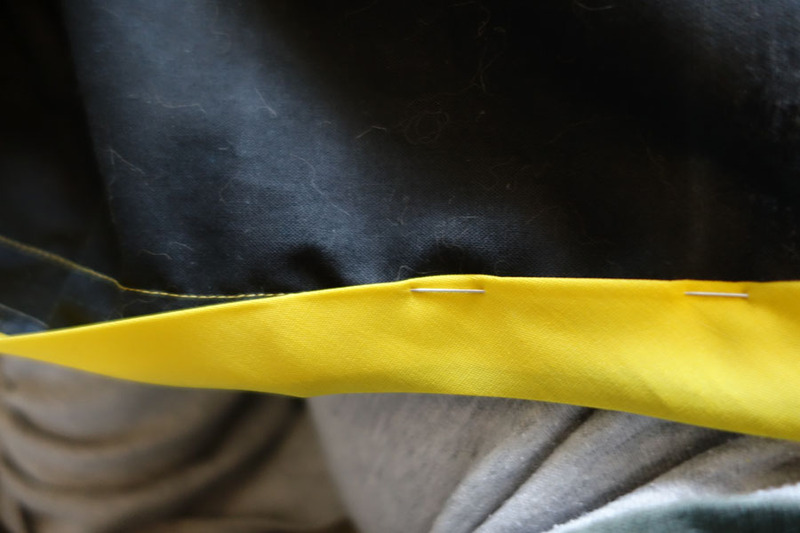 Place your bias tape at the edge of the fabric where you want it. Follow the length and figure out how much you need. Leave at least 1/2” on either edge for excess. If you have to sew a corner, add a good 1” more. 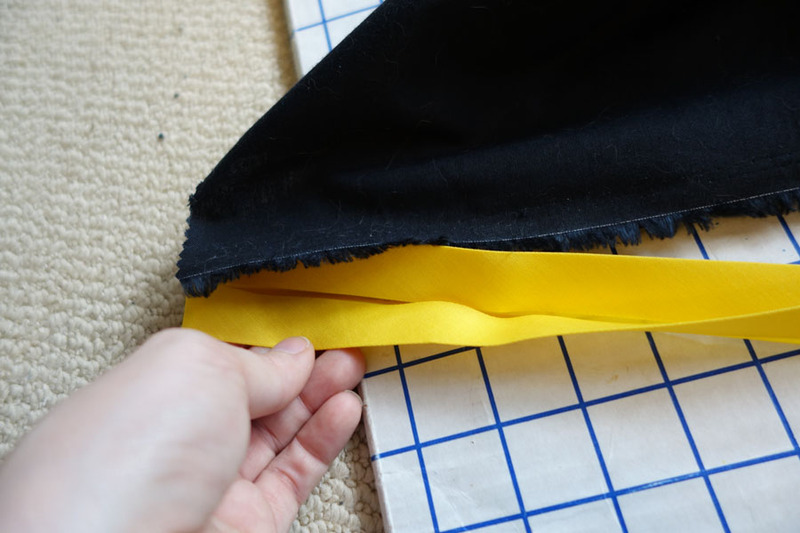 Fold your bias tape over the edge to figure out how close you want to get it. 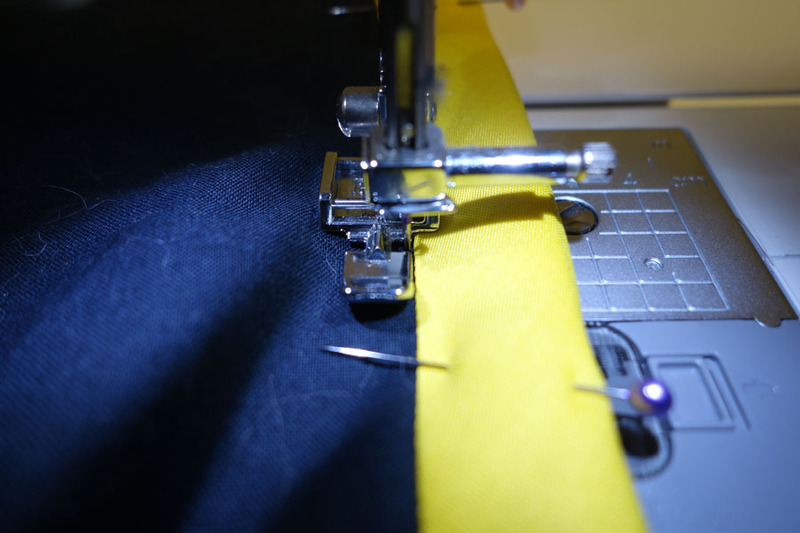 With pre-cut bias tape you could place the edges equal, but it's never a straight line. 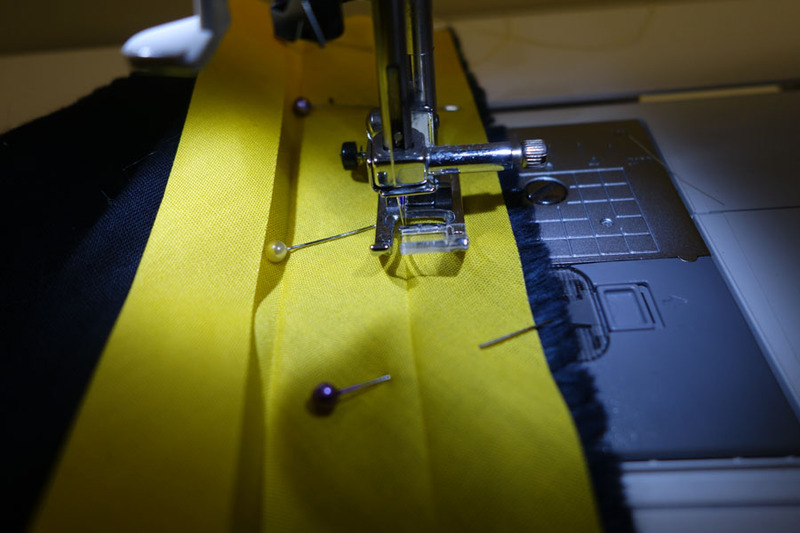 Figure out your optimum point, open up the tape, and pin RIGHT sides together on the RIGHT side of your fabric edge. For your top thread, choose the color that matches your bias tape. For your bobbin, choose a color that is bold on your pattern fabric (if your bias tape color does that, use it!) 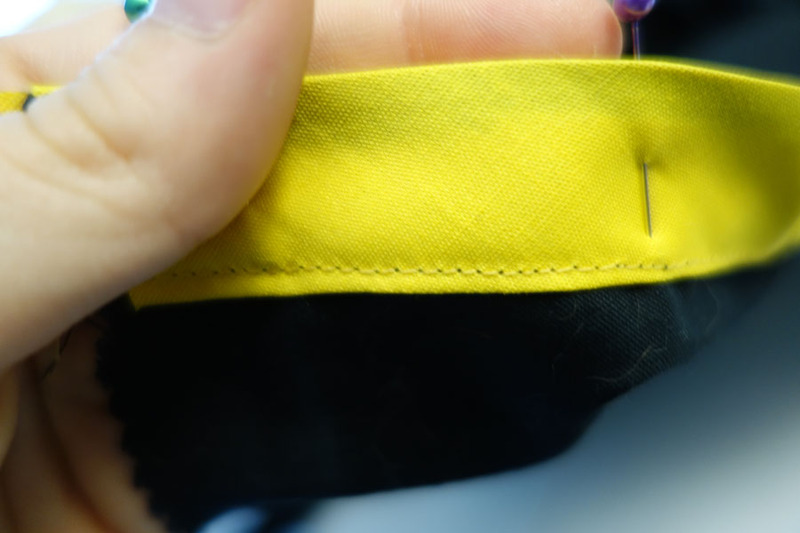 Sew a straight stitch following the crease of the fabric to the end of your bias tape. If you need to make a mitered corner, this tutorial can be a big help towards that. Flip your fabric over. See that lovely thread for where you stitched your right side down? That is your guiding line! 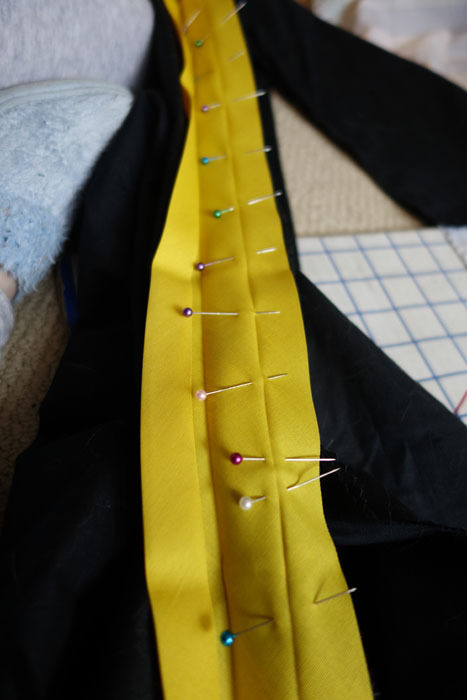 When you fold over your bias tape to pin down the opposing side, your mission is to ensure that passes OVER your thread (aka the bias tape will hide it.) It doesn't need to be miles past it, but enough to at least cover the thread. 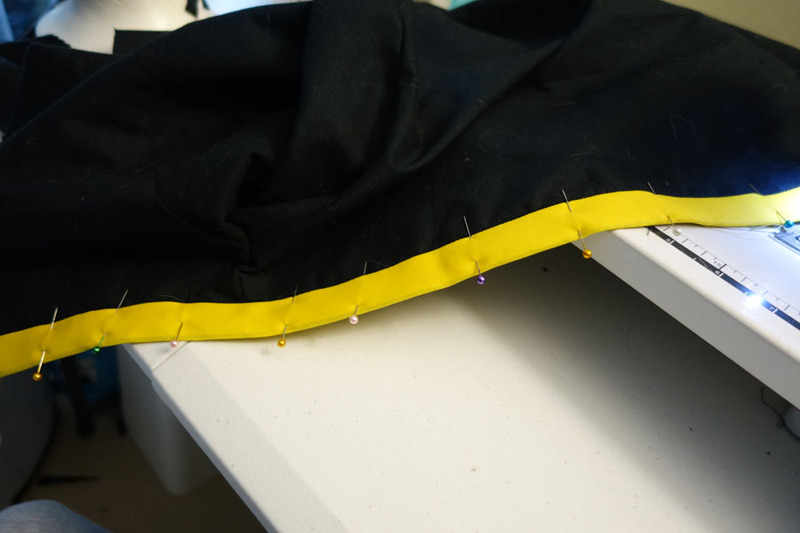 If you want to test if it's going to be far enough, pin parallel through the fabric and flip it over to ensure that your pin does not touch the opposing side of the bias tape. Note: Sewing over larger needles with a zipper foot isn't 100% effective. I learned this the hard way... Though my fabric is shown in these pictures with needles, it might be best to take a nice bold color and base stitch it down by hand with some long stitches. You're going to want to sew from the RIGHT side of the fabric here. Place your needle/foot judge on the edge of the bias tape on the top side and sew along that. 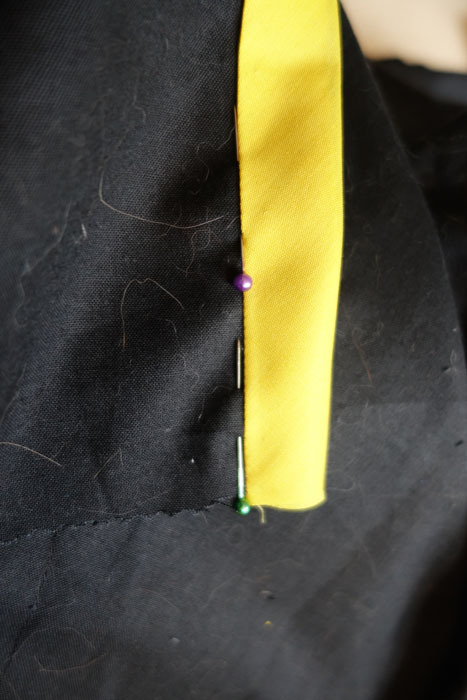 By doing this you are using a matching color of your fabric to be semi-hidden away by the bias tape, while the bottom side is being stitched down by the bobbin thread. 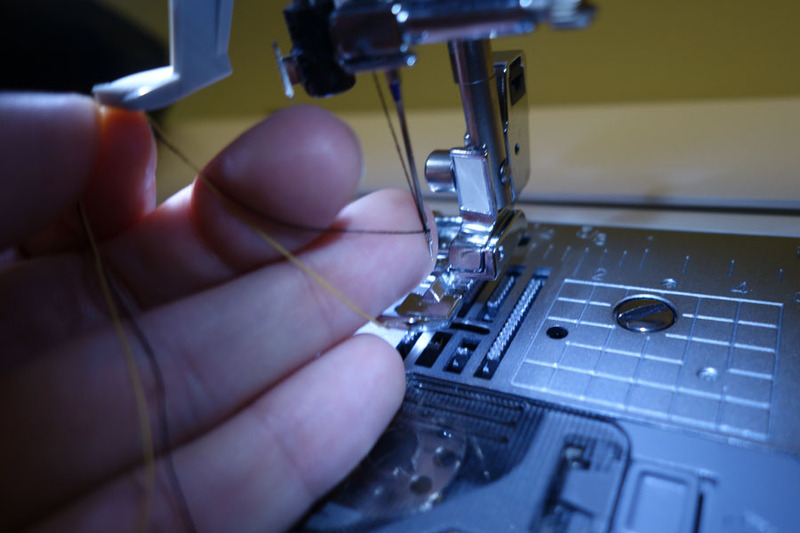 It won't be the straightest or cleanest stitch, but it works for what it needs to do. 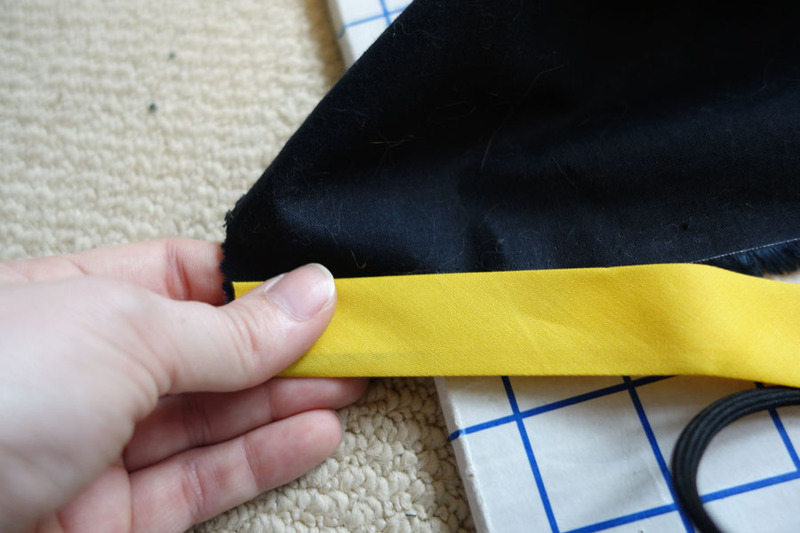 There you go, clean bias tape on the edge of your fabric without the hassle of hand stitching!